In a telephone interview, Napolitano provided pragmatic solutions to DHS’ immigration enforcement mishandlings while being careful not to get ahead of President Obama and Congress on the subject of immigration reform. 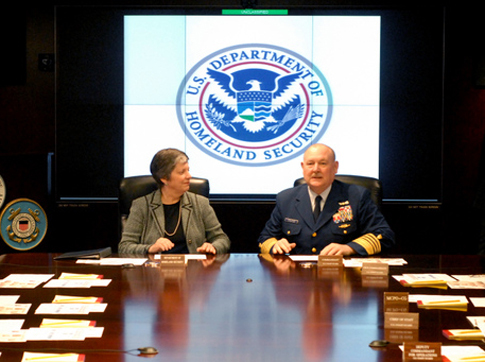 Napolitano reaffirmed the need for fair enforcement and rule of law at the border, specifically the need for appropriate manpower and technology. No surprise there. Check. Napolitano also highlighted the need for interior enforcement of unscrupulous employers who are “intentionally going into the illegal labor market and creating a demand for illegal laborers.” Check plus. In a departure from the Bush administration’s ineffective “just build a fence” immigration policy, Napolitano responded to questions about the 700-mile border fence with “you cannot build a fence from San Diego to Brownsville, Texas, and call that an immigration policy.” Underline. Check plus plus. And when asked about federal immigration policy, Napolitano underscored the need to “facilitate the applications of citizenship for those who are entitled to become citizens.” Gold star. We want enforcement of our nation’s immigration laws; we want at the right time to take up the whole issue of immigration; and we want to do what we can administratively to help those who are entitled now to become citizens under our law to get through that process. Napolitano, unlike her predecessor, is looking to “restore integrity” to immigrants while enforcing our immigration laws and keeping America safe-which, believe it or not, are not mutually exclusive.